This is a fitted dress I made for a wedding using some beautiful vintage guipure lace. The colour is a really watery sea blue green, and it is underlined in some cream dupion silk, also quite old and from my stash. I made this dress some time ago but have struggled to get adequate photos. In the end I have had to admit defeat on the photography front and I’m using what I have in order to blog it before I forget the details, so I am so sorry if the only image of me actually in the dress casues eyes to twitch from the terrible glare and shadows. I’ve got lots of indoor shots of the dress up close though, so hopefully that will make up for it. I used the same bodice pattern as for this dress, which is a mash up between the Colette Peony (the sleeve) and the Simplicity 1873 or Emery dress (or most likely it’s a combination of the two) and added a simple quarter circle skirt. I have since moved those bodice waist darts out a little on the pattern piece as after I wore this I realised that they sit a little too close. I underlined the dress with some ivory dupion silk I had in stash, and left the sleeves unlined. With its original demure neckline and below knee length the dress was looking very “queen mother” which would have been lovely if I was in my 80s but I’m not really ready to go there yet. After some reflection I widened and dropped the neckline and added a deep v in the back as the dress. I also ended up making it rather shorter than my usual length, ending up with an above knee length. On looking through some vintage patterns the style is very typical of the early 1960s. Deep V back and hand picked centred zip. To help the lace be supported adequately by the the underlining I thread traced the lace in rows along the skirt, using the method shown here by one of my absolute favourite blogs A Challenging Sew. By hand picking the zipper the stitches are invisible although I could have done a better job at getting the join closer as it pulls slightly too far apart when worn. 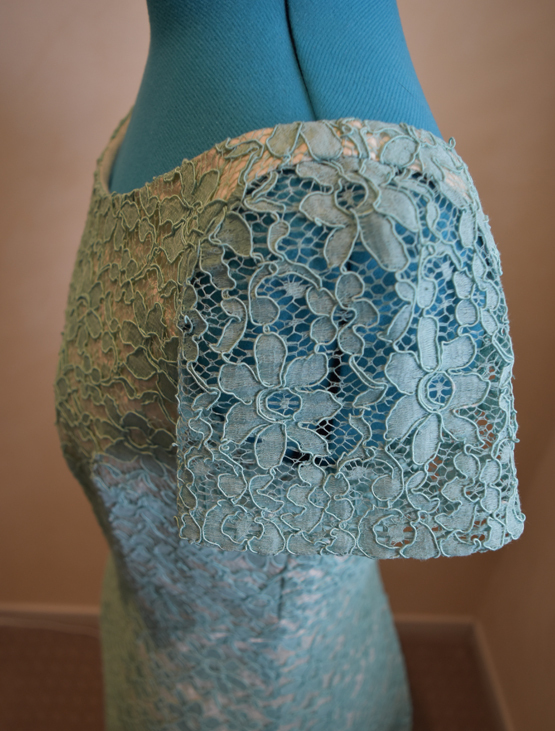 A deep hand sewn hem with a lace trim to hide the unfinished edges. Inside of neckline finished with wide cotton tape to hold shape and prevent stretching out. I steamed the cotton tape into shape before hand stitching. I haven’t lined the dress although I wish I did, I ran out of time in the end. It’s a nice dress to add into the wardrobe for those times I need to be a little more dressy and I always really appreciate wearing a piece of history.